Not sure what to do with all that leftover Thanksgiving turkey? 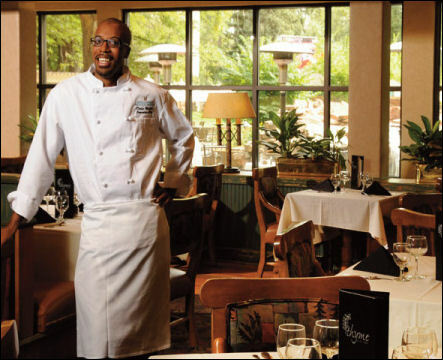 Instead of making the usual turkey sandwich, Dedric McGhee, executive chef of Thyme on the Creek, the in-house restaurant at the Millennium Harvest House Hotel in Boulder, Colorado tells us how to create delicious Green Chile Turkey Enchiladas that the whole family can enjoy. 1. Add the butter to a warm sauté pan. 2. Add onions and sauté until translucent. 3. Add garlic and cook until it becomes aromatic. 4. Add flour and cook for 1 minute. 5. Pour both cans of green chiles into pan. 6. Add cumin, oregano, coriander, chicken broth and a little salt and pepper. 7. Simmer for 5 minutes at low heat. 8. Place turkey in a mixing bowl. Add 1/3 cup of the green chile mix, 1/3 cup of sour cream, 1/3 of the cheese mixture and salt and pepper. Mix well. 9. Grease a 13×9 baking dish. 10. Place 1 to 2 tablespoons of filling in each tortilla and roll up. Place the rolled tortillas in the baking dish seam-side down. 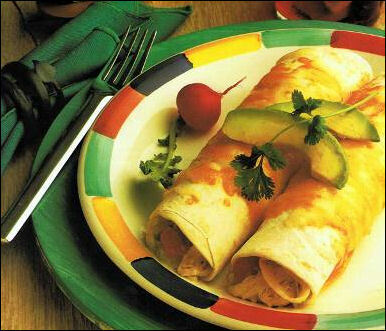 Continue to add rolled tortillas until the top layer is filled. 11. Pour the rest of the green chile on top of the enchiladas and sprinkle with remaining cheese. 12. Bake at 350 degrees for 20 to 30 minutes or until hot and bubbly. Serve with sour cream, green onions and salsa.